These leather sheaths are for knives by Chris Reeve Knives from the USA. Chris Reeve is perhaps most famous as the maker of the popular Sebenza folding knife, you can see their knives at the Chris Reeve Knives website. 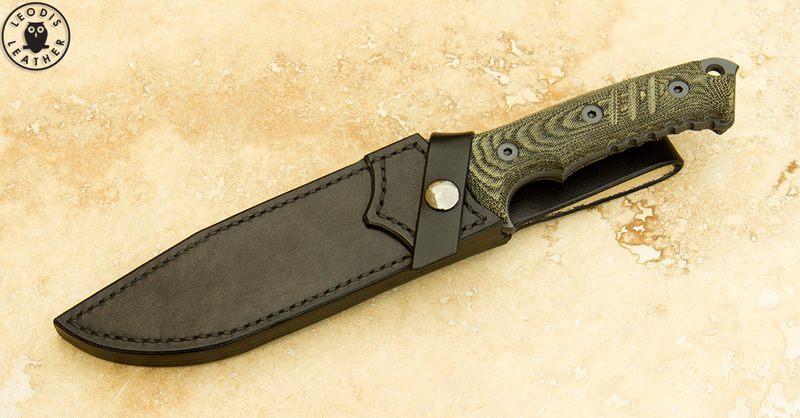 Continuing the proud tradition of Chris Reeve Knives honoring elite military, the Reeve/Harsey collaboration - the Pacific - is the civilian version of a knife created to celebrate the 50th Anniversary of 1st Special Forces Group. Based in Ft. Lewis, WA, 1st Group's theatre of operations is Asia and the Pacific, so the name Pacific has been chosen to honor the home and work place of these fine soldiers.